Can you guys learn to love this caramelized onion dip even if it is not a) healthy, or b) particularly beautiful? Can you look past outward appearances to the soul of the caramelized onion dip which is, above all else, extremely luscious, totally delicious, and wonderful to share with friends? Can you envision a future for this caramelized onion dip that includes fall burgers, sandwich spreads, and maybe even a little something to help you get extra with your eggs? I knew you could. I knew you had that in you. Mostly I knew because you guys have been so awesome at bugging me on Instagram for this recipe, which I absolutely love! I bet I’ve gotten a hundred messages about the onion dip since I made it first for Labor Day and then AGAIN on my stories. Errybody be wantin some onion dip! And rightly so. Go after your dreams, kids. I recently started digging into the land of Instagram direct messages and once digging myself out from under the mountain of messages waiting for me after not using it for the last four years, I came up for air and I’m now having a lot of fun getting your LIVE feedback when I make recipes or do random things like lettering. I know, we haven’t even talked about the lettering. I started lettering, you guys. I have an iPad Pro and an Apple pencil and I’ve downloaded some brushes and some worksheets and now I practice writing in fancy digital cursive in my free time. Do you watch lettering videos on Instagram? Start following some peeps – they are the most relaxing videos ever and I love watching them. FREE THERAPY. Okay, I digress. Mostly what I’m trying to say here is that if my Instagram DMs are any indication of the internet’s ability to love caramelized onion dip for the beauty of its soul, then I have full confidence that this is going to be a winner. The caramelization here is obviously key, and as with most of life, wine helps, but water can also soften things up for you if you’d rather not with the wine. What matters most here is TIME. They just need time. A good nonstick pan, a knob of butter, some gentle heat, and lots of patient time. We are looking for that deep golden brown color – my rule of thumb is that once I think they look pretty good, I give them another ten minutes just to be safe, and I’m always glad I did. We want deep, dark, sweet, soft, and fragrant. After that, things get pretty basic: cream cheese, sour cream, a dash of this and a sprinkle of that… boom. Grab a chip and DIVE TO THE BOTTOM OF THAT GOLD MINE. We may or may not have busted this onion dip out not once but TWICE during our Labor Day party. I mean, at a certain point, it’s time for second lunch, ya know? I was just doing what was best for the group. Chips are a good dipping option (says the food blogger obsessed with all kinds of chips). I am partial to sour cream and cheddar ruffle-cut chips here, but plain potato chips are fine as well. I can also vouch for bagel chips, pita chips, pretzel crisps (especially Parmesan Garlic! why dey so good) and if you need to go the veggie route then FINE, yes, snap peas and red peppers and cherry tomatoes are also nice. If you are making this recipe to eat between two people, I’d suggest cutting it in half. It will give you A LOT of dip. It is ideal for a big party, like 10-15 people. GOOD NEWS is that it will keep well in the fridge for 3-4 days so you can relive the joy on all your future eats. I have yet to find a savory breakfast, lunch, or dinner that did not benefit from a spoon-plop of caramelized onion dip on top. This caramelized onion dip is a total crowd pleaser! Serve with chips, pita or bagel crisps, or on sandwiches and burgers. YUM. Prep: Peel the onions and slice them very thinly. I find it helpful to use a mandoline for this. Sauté: Heat the butter in a nonstick skillet over medium heat. Add the onions, sprinkle with salt and sugar, and saute for 10-15 minutes, stirring every few minutes. Pour a little bit of wine in and let it sizzle out. Stir, add wine, sizzle, etc. After about 30 minutes, your onions should be deeply golden brown and fragrant. Mix: Transfer onions to a cutting board and chop coarsely into small pieces – or just use a kitchen scissors and snip them up right in the pan. Mix the cream cheese and sour cream. Mix in the onions and a handful of fresh parsley. Taste and season – if you want just a little sumthin sumthin extra, add a small splash (like, a tablespoon or less) of soy sauce and/or Worcestershire. This just gives it a little depth and umami flavor. I also like this with a mayo base, so sometimes I’ll swap half of the sour cream or cream cheese for an equal amount of mayo. I used Sauvignon Blanc for the wine, but water works fine, too. You just want to keep the onions from getting overly dried and browned and the liquid helps them stay juicy and caramely. Yes! I can definitely get on board with this dip – I’m a fan of sour cream chips too 😉 oh and don’t forget the salt and vinegar. I think you reached into the depths of my childhood to bring forth this amazing recipe! 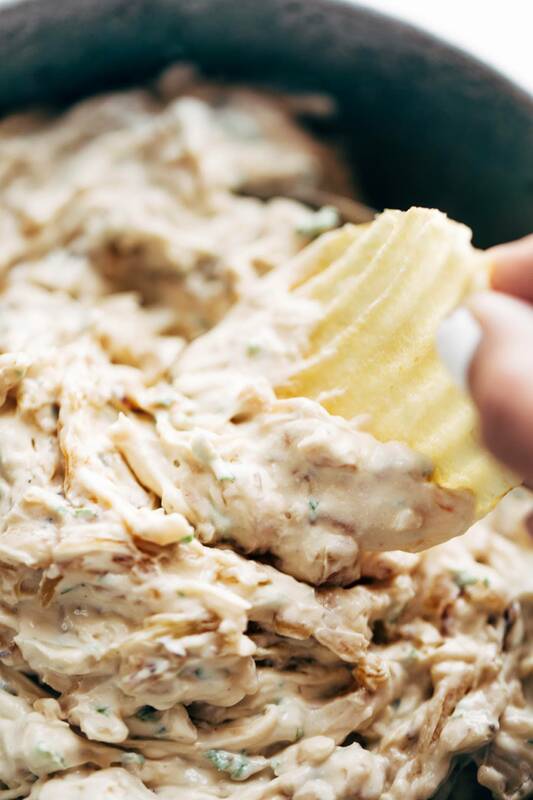 Sour cream ruffles were the chip of choice in my house growing up, and though my mom never made this onion-y dip by hand we always had some in the fridge from some holiday event the month before. I think I know what I’m bringing to Thanksgiving this year! Also, that close up of beautifully caramelized onions nearly brought tears to my eyes it looks so good! I’m just never patient enough to get them truly caramelized. Great idea! Will try that. YUMMMMM!!!! I am so trying that this tonight. Also, thanks for the tip on carmelizing the onions. I’m assuming it’s ok to substitute Greek Yogurt for sour cream. I can’t remember the last time I’ve actually bought sour cream since I’ve found Greek Yogurt. The recipe says it makes 12 servings. This suggests that one might SHARE this deliciousness. Have you considered that the 12 servings means 12 times you can consume it in a day all by yourself? I am going with that. What a great idea! And beautiful photography! You managed to make the dip look pretty which is not an easy endeavor! Yum! Onion dip is so one of my favorites! Totally unrecipe related…what tool do you use to compile vertical videos? I can’t seem to find anything on my phone that works! This looks great, I don’t know why you say it’s not so pretty 🙂 I make something similar sometimes, it’s mayo/sour cream based and baked in the oven until it’s all bubbly and golden on top. I love to eat it hot on slices of baguette. My hips not so much though. love the idea of this on a burger, even a grilled chicken sandwich and an inspired recipe, at least to me since my dips usually come from the store, thank you! This looks absolutely fabulous! I’ll probably try it as is (and eat store brand French onion while I make it), but for those who really need it healthier or vegan I’d sub a block of soft tofu soaked in salt water and lemon juice for half an hour blended with a few tablespoons coconut oil for the sour cream and cream cheese. Thanks for the lovely recipe! This recipe had my mouthwatering for days until I tried it. And when I finally did, it was 100% well worth the wait! I love me some onion dip, it’s very retro. I’m thinking of making a double batch of those carmelized onions and using half to make a vegetarian onion soup. So yummy!! Can switch it up and add a roasted head of garlic and bacon!!! The onion with cream is yamm. I make a dip almost exactly like this but I also add a little beef broth and sherry vinegar. It is to die for! I made it for the 4th of July and served it with Terra sweet potato chips for a grown up Ruffles and onion dip and everyone went nuts. Share you receipe with your ingredients too. The more the merrier! LOL I am definitely going to try this receipe since it has such raves. If I had to choose one thing to eat everyday for the rest of my life, it would be chips and dip. This dip looks amazing! So true! Hope you enjoy it! Best chip dip I’ve EVER eaten! Thank you for this inspiring recipe! My husband and I are in Europe for six months and have so many foods from home we miss, namely, onion dip! We followed your lead using ingredients we could access. We used Greek yogurt instead of sour cream, whiskey instead of wine and it was amazing!! I am sure your original recipe is better and can’t wait to try it again when I can. Thanks for sharing this super comforting and delicious recipe! So glad to hear that, Caitlin!